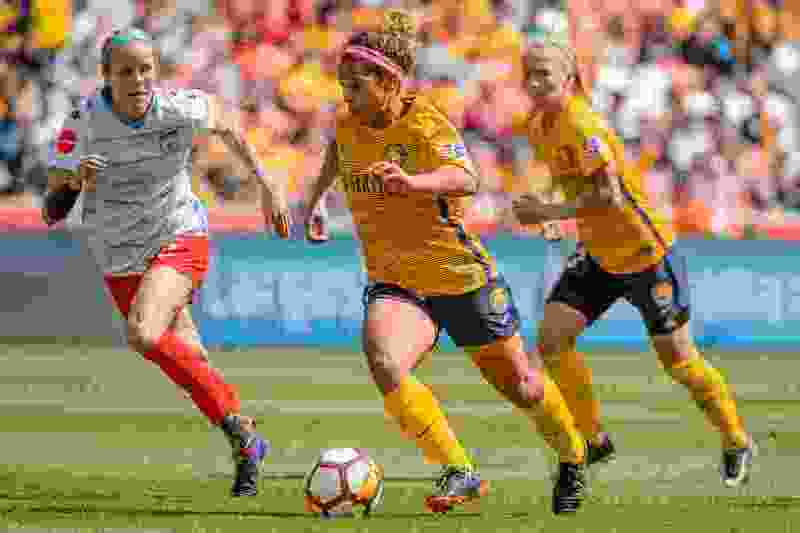 (Trent Nelson | The Salt Lake Tribune) Utah Royals FC hosts the Chicago Red Stars, at Rio Tinto Stadium in Sandy, Saturday April 14, 2018. Utah Royals FC midfielder Desiree Scott (11). Sandy • It took about two years for the woman now known as “The Destroyer” to not shake in her boots around the midfielder she’d one day call one of her closest friends. It was 2010, and Desiree Scott was relishing her first days as a senior member of the Canadian women’s soccer team. When you’re a newbie, you get the rookie treatment, so when Diana Matheson told Scott to clean up after a training session, Scott was intimidated, and she remained that way for a while. Actually, that’s an apt description for both of the Canadian international soccer household names — Matheson is 5-foot tall while Scott stands at 5-foot-3 — who are now two parts of the Utah Royals FC midfield. In the organization’s first year as an expansion franchise, its acquired some of the top domestic U.S. talent in worldwide soccer in Becky Sauerbrunn, Kelley O’Hara, Amy Rodriguez, and most recently, Christen Press. The Royals also went for established names north of the border, too. And it’s Matheson and Scott who have helped pave the way for the club serving as veteran voices as Utah feels out its way throughout Year 1 in the NWSL. Matheson, 34, and Scott, 30, have been regulars in the Royals starting lineup and will have a say in whether or not they will be in the postseason conversation in two months. Their paths on the professional level have weaved around the world, as most players do. They’ve been national team regulars together since Scott’s arrival on the stage eight years ago. They’ve featured in a FIFA World Cup. But this year is special to the duo. Matheson, was in Seattle last year with Harvey, but missed the season with an ACL injury. She spent time in Washington and prior to that, was playing overseas in Norway. Scott was in Kansas City a season ago, and when the franchise was relocated to Utah, she’d hoped that somehow the midfield tandem regularly on display for Canada basically every international break could be team up in Royals gold. When Scott heard Utah was acquiring Matheson, she whipped out her phone and immediately sent an elated text message to Matheson. In her first year in the Utah midfield, Matheson, who hails from Toronto, has two goals and one assist in 14 starts. Scott, from the Winnipeg, has started 17 regular-season matches. In a league as small and stacked with talent as the NWSL, Harvey always had a dream list of players she’d hoped to coach. Matheson was crossed off the list twice, and she was always chasing after Scott, prodding Kansas City to see if they’d be open to a deal. “She’s just so very, very good at what she does,” Harvey said. Matheson recalls when Scott — now considered the premier defensive midfielder in international women’s soccer — arrived on the national-team scene as a young winger. That, obviously, didn’t work. Since, the teammates have thrived playing alongside one another in the center of the field. As Scott noted, having a slice of home when you’re away from it is a positive, according to Matheson. Kickoff » Friday, 8 p.m.
About the Courage » With the 2018 Tournament of Nations set to begin, NC will be minus national-team call-ups Abby Dahlkemper, Merritt Mathias, Jaelene Hinkle, McCall Zerboni, Sam Mewis and Crystal Dunn. ... Courage forward Lynn Williams was named NWSL Player of the Week after scoring a hat trick in a 4-0 win last week. ... Williams leads NC in goals scored in 2018 with eight. About the Royals » Utah will be without captain Becker Sauerbrunn, Amy Rodriguez and Christen Press who were called up to the U.S. national team for the Tournament of Nations. ... Forward Brittany Radcliffe scored the goal in the win at North Carolina June 16, which remains the only game the Courage have lost this season. ... Kelley O’Hara (hamstring) remains out. ... Midfielder Katrina Gorry was called up by Australia but will report on July 23.